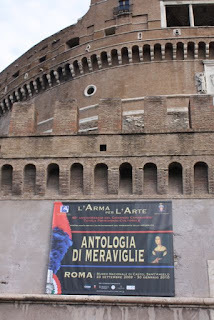 At the end of last week I was able to visit the Museo Nazionale di Castel Sant'Angelo in Rome for the new exhibition, 'L'Arma per l'Arte: Antologia di meraviglie'. This show celebrates the 40th anniversary of the Comando Carabinieri per la Tutela del Patrimonio Culturale. There are 60 exhibits including paintings and other works of art. 1. Protocorinthian olpe. Formerly Princeton University Art Museum 995-149. 2. Caeretan hydria. Odysseus and Polyphemos. Formerly Shelby White collection (and on loan to the Metropolitan Museum of Art, New York). 3. Attic black-figured cup. Symposium. Formerly Malibu, J. Paul Getty Museum 87.AE.22. 4. Attic red-figured calyx-krater. Zeus and Ganymede. Eucharides painter. Formerly Shelby White collection (and on loan to the Metropolitan Museum of Art, New York). 5. Attic red-figured calyx-krater. Orestes. Formerly Malibu, J. Paul Getty Museum 87.AE.66. 6. Apulian loutrophoros. Formerly Malibu, J. Paul Getty Museum 84.AE.966. 7. Bronze statue of Victoria. From Herculaneum. Formerly Royal-Athena Galleries, New York. 8. Marble statue of Tyche. Formerly Malibu, J. Paul Getty Museum 96.AA.49. 9. Marble statue of Sabina. Formerly Boston, Museum of Fine Arts 1979.556. 10. Bronze Etruscan candelabrum. Recovered from private collection at Vulci (2005). 11. Attic red-figured calyx-krater. Death of Sarpedon. Formerly New York, Metropolitan Museum of Art 1972.11.10 (L.2006.10). 12. Bronze statue of Zeus. Firenze, Museo Archeologico Nazionale inv. 2291. Recovered in 1985. 13. Bronze handles from krater. Tuscania (VT), Museo Archeologico inv. 70820. Recovered in 1982. 14. Marble relief with Hercules. Napoli, Museo Arheologico Nazionale inv. 6683. Recovered in 1978. 15. Marble group of Capitoline Triad. Palestrina, Museo Archeologico inv. 80546. Recovered in 1994. 48. Etruscan bronze candelabrum. Melfi (PZ), Museo Archeologico Nazionale di Melfese inv. 110076. From Ruvo del Monte. Recovered in 1981. 49. Marble sarcophagus fragment. Amazonomachy. Roma, Antiquarium Comunale del celio, inv. Ant. Com. 34095. Recovered in 1998. Gill, D. W. J. 2009. "Homecomings: learning from the return of antiquities to Italy." In Art and Crime: exploring the dark side of the art world, edited by N. Charney: 13-25. Santa Barbara: Praeger. Chippindale, C., and D. W. J. Gill. 2000. "Material consequences of contemporary classical collecting." American Journal of Archaeology 104: 463-511. Gill, D. W. J., and C. Chippindale. 2006. "From Boston to Rome: reflections on returning antiquities." International Journal of Cultural Property 13: 311-31. —. 2007a. "From Malibu to Rome: further developments on the return of antiquities." International Journal of Cultural Property 14: 205-40. Doesn't all this just divert attention from the real problem-- Italy's unwillingness to fund its cultural heritage establishment properly and to adopt more rational laws-- like PAS and Treasure Trove --that would ensure that the State only keeps what it can reasonably be expected to take care of? Peter Popham's article dates from 2005. IIANM, the English Treasure Law of 1996, which codifies older practice with some changes, makes treasure the property of the crown and has nothing to do with the state's ability to care for objects. Therefore, it would make no difference for this class of finds in a country that does already makes archaeological finds the property of the state (like Italy, which also already compensates landowners for finds made on their property). Besides which, caring for a building is hardly on the same scale as caring for ceramic pots.